We've been holding off on posting the review to this next game in order to have the 500th review of SuperPhillip Central be designated to Shovel Knight. With that review finished, now we can focus on Bombing Bastards, a Bomberman clone for the Wii U eShop. Should it be bombs away for Wii U owners? Oh, my God! They bombed Kenny! Ever since Konami acquired Hudson, Bomberman has been missing in action for quite some time, and has therefore left a void in the gaming industry that only a competitive action game where you blow opponents away with bombs can fill. The folks at Sanuk Games have taken it upon themselves to try to fill that void with the blatantly Bomberman-inspired (not that this is a bad thing) Bombing Bastards for the Wii U eShop. Is the game a suitable substitute? For solo players, Bombing Bastards has a single player campaign that spans five worlds that each come equipped with six levels apiece. 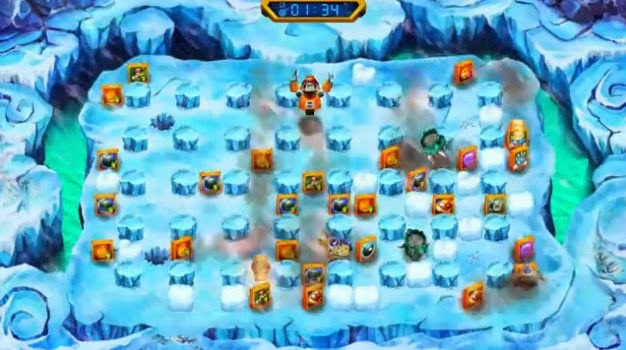 These levels have you doing your best to take out all AI enemies as fast as possible. This is all the while not blowing yourself up or getting touched by a foe. The sixth level of every world pits you against a boss, and these levels are simply put, aggravating at best. Bosses have too much health, and all it takes is one hit for you to have to start from the beginning to the bout. Thankfully, as if Sanuk Games knew how devilish these boss encounters were, these levels aren't mandatory to beat. Kill these bastards with fire. 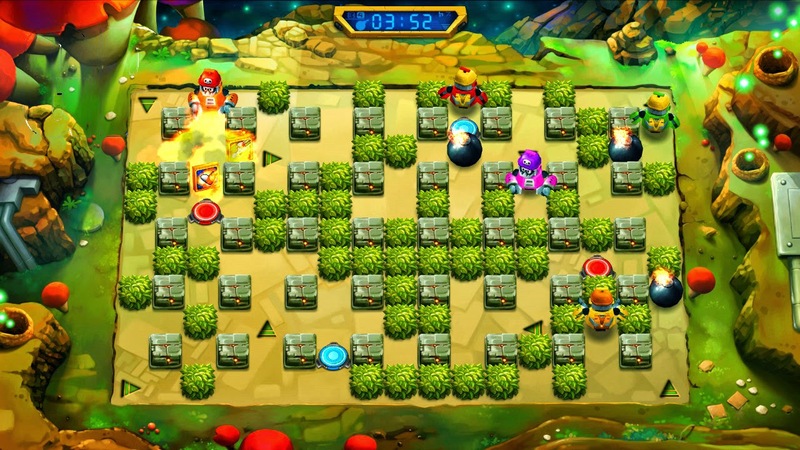 The meat and potatoes of an action game like Bomberman or Bombing Bastards is its competitive multiplayer side. Unfortunately, Bombing Bastards doesn't quite get this right either. Matches are sluggish in speed, offering bombs that take their sweet time to actually explode, only furthering the ennui Bombing Bastards's multiplayer brings. This would be fine if you didn't have to blow away obstacles like blocks in order to reach opponents. By the time a path has been cleared to a rival, a sizable chunk of time has expired and so has a sizable amount of interest in the match. Losing like that was SO not the bomb. Sadly, there is no option for online play, which would have been absolutely perfect for a game like this. It's a difficult sell to get a group of friends to choose to play a slow match of Bombing Bastards when there are far more appealing and exciting games on the Wii U eShop to play already, and Bombing Bastards becomes an even bigger losing proposition when you factor in retail software. On the topic of presentation, Bombing Bastards exudes a nice bit of charm, particularly from the solo campaign's doctor character who exclaims various bomb-related puns and statements when you destroy enemies. It's cheesy, yes, but it works well. The different arenas aren't much to look at, but they do have a bit of personality to them, each with their own stage gimmicks like teleportation pads and flame geysers. The music that is featured in Bombing Bastards is all public domain music given a modern twist. It would have been nice to have wholly original music just to give Sanuk Games's eShop title a little more personality of its own. 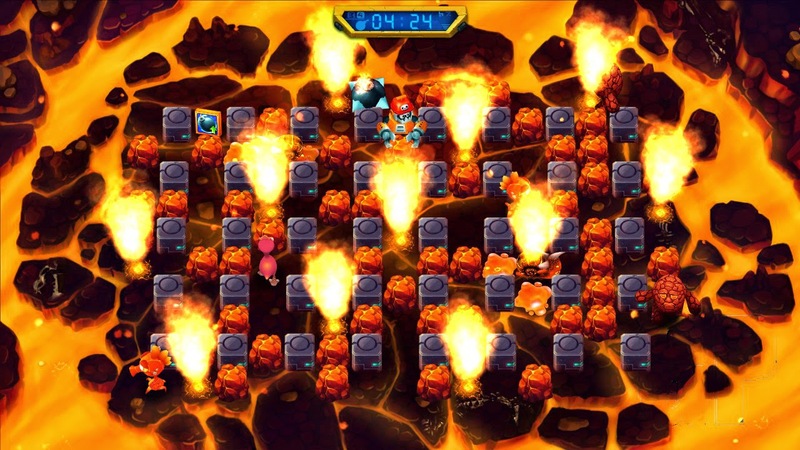 With Bombing Bastards, what you end up with is a Bomberman clone that doesn't really do much to fill the space that its inspiration has left. It doesn't offer an engaging multiplayer experience, especially with a total lack of online and a pace that is too slow to hold most players' interest. Its single player aspect is a bit fun at first, but it quickly grows tiring and tedious too. Bombing Bastards is by no means a horrible game, but there's much better avenues to take if you're looking for an engaging solo and local multiplayer experience. All in all, this bomb is a little bit of a dud.